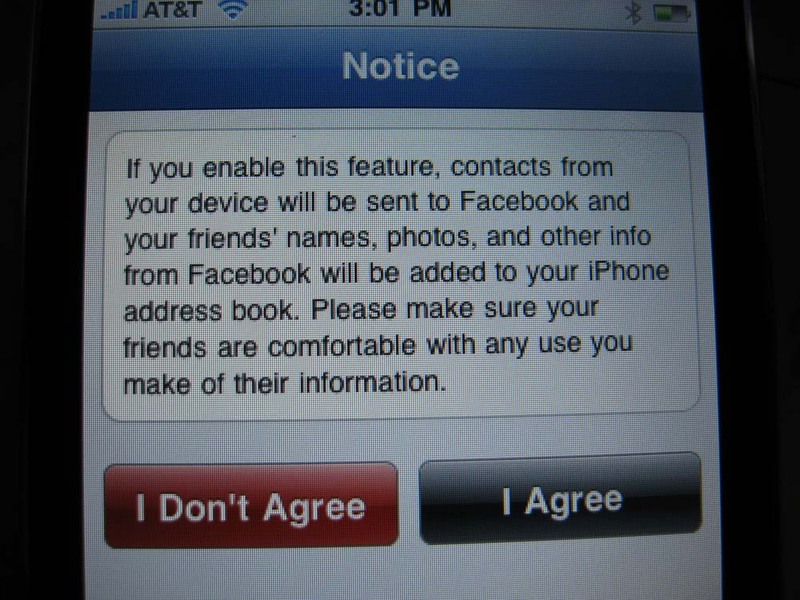 Facebook for iPhone Friend Sync: Should we be worried? In the last release of the Facebook app for the iPhone (V 3.1) a new feature was added under the “Friends” tab, allowing you to sync your iPhone contacts with your Facebook contacts.Â The biggest impact is that when a friend appears on Facebook as well as in your phone contacts, their photo will be downloaded from Facebook and used with the contact profile.Â The sync will also add a link to facebook profiles in your contacts.Â This is nothing that couldn’t be handled with a 3rd party application in the past, but now it’s integrated into Facebook.Â If someone is your friend on Facebook but not in your contacts, a contact will not be created. That’s kind of an ominous TOS statement.Â What happens to my contacts once they’re sent to Facebook?Â What do they mean by “make sure your friends are comfortable with any use you make of their information?”Â Does that mean I’m giving Facebook and its advertising partners full access to phone numbers and e-mail addresses stored in my phone?Â Facebook has pulled off some really unethical moves like that in the past, so it wouldn’t surprise me.Â It will be very interesting to see if anything comes of this. Author JayPosted on January 14, 2010 January 22, 2016 Categories MarketingTags facebook, iphone, privacy1 Comment on Facebook for iPhone Friend Sync: Should we be worried?